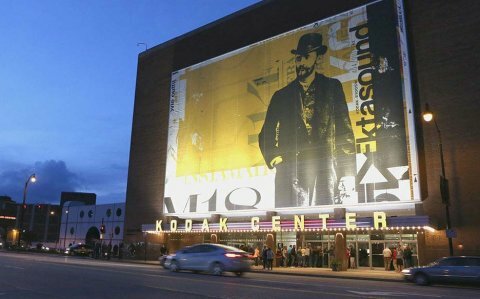 Rochester, N.Y. Sept. 7, 2017 — Eastman Kodak Company officials lit up a new marquee and digital sign during a celebration event Thursday at Kodak Center Theater. A crowd across the street cheered as the new additions lit up the dimming sky, providing a glimpse at the acts Kodak Center Theater will host in the future. 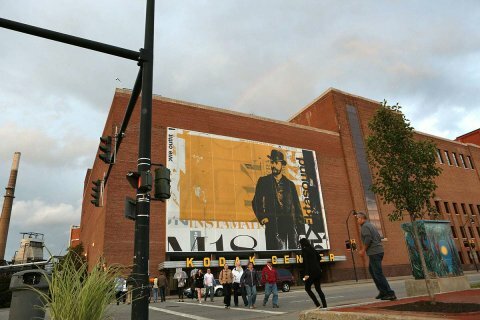 Formerly known as Theater on the Ridge, Kodak Center is a gathering place for conferences and events, including a 1,968-seat main theater, a 180-seat studio theater, a 13,000-square-foot gymnasium and ballroom, conference rooms, classrooms, dining rooms and more. The venue offers a favorable location in relation to downtown Rochester and main expressways, with more than 1,047 parking spaces providing easy access. Until now, the theater had never had a marquee. 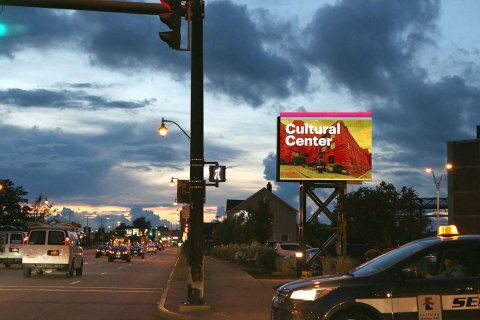 Taking it a step further, the 108-square-foot digital signs will promote events to the estimated 40,000 vehicles that pass by Kodak Center every day. Officials also announced a new partnership with SMG, the largest venue management company in the world. SMG manages almost 70 theaters and represents local and regional venues, including Blue Cross Arena in Rochester, CMAC in Canandaigua, the ONCenter in Syracuse and the Times Union Center in Albany. SMG’s job is to attract popular acts, promote them to the public and manage the in-house experience for visitors. The venue will focus on attracting concerts, comedy acts, and various performing arts and community events. Some upcoming acts already booked for Kodak Center include the Dear Future Me Tour on Sept. 10, Momma’s Boy on Sept. 19 and comedian Tim Allen on Dec. 2. Tickets and a full list of scheduled acts are available at www.kodakcenter.org. Eastman Business Park is a 1,200-acre R&D and manufacturing campus with over 16 million square feet of multi-scale manufacturing, distribution, lab and office space. There are 100 companies onsite employing over 6,000 people, many of them responsible for the development of our nation’s next generation technologies in the areas of Energy Storage, Chemical Manufacturing, Roll-to-Roll Manufacturing and Photonics. Additionally, the Park’s immense manufacturing infrastructure—including the private utilities and onsite water and wastewater management system—is a competitive advantage for its high-use tenants, especially in the Food and Agriculture industry.